OpenOffice.org doesn't come with a simple way to reset its recent documents history, but there are several methods available. Installing the History Manager extension is quick and easy on Linux, Mac, or Windows. Reload OpenOffice.org, and then click Tools - Add-Ons - History Manager. Then, use the simple dialog to resize or erase the list. 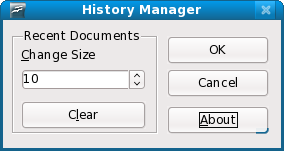 History Manager 2.1 was released when OpenOffice.org 2.4 was the most recent version, but History manager clears the history on OpenOffice.org 3.0.0. BleachBit is a file and privacy cleaner (by yours truly) for Linux. BleachBit is most convenient if you want to clear multiple applications (such as Firefox, Adobe Flash, and OpenOffice.og) at once. Simply install BleachBit, check the box for OpenOffice.org - Recent Documents, and then click Delete. You should also delete the OpenOffice.org cache because it contains a cached copy of the recent documents history. Edit Common.xcu and remove the XML node History. Alternatively, you can delete the whole file, but you will lose a bit of information such as whether you registered OpenOffice.org. Finally, delete the corresponding cache file org.openoffice.Office.Common.dat in the /user/registry/cache/ directory, or you can re-run OpenOffice.org to regenerate the cache. Unfortunately the History Manager doesn't work in OOo 3.0.0 (under Kubuntu 8.10). I can install it without problem, but it doesn't do anything. The number of entries resets to 10 no matter what, and the clearing of the document list just doesn't happen. I had the same problem, but then I simply closed the program and restarted it. When I did I noticed that the changes had taken effect and the history was cleared. Had the same problem untill I closed the OpenOffice Quickstarted in the Program Tray it must have been replacing the file history. I installed in OO 3.2 and did not want it. I cannot now remove it. I have looked for the Common.xcu file and searched and can not find it except in a Installation directory. I finally got History manager removed by deleteing OO 3.2 and hiden application data\openoffice. Then reinstalling OO 3.2. The long way around but got it removed.